As per the Company website it has plants in Faridabad, Pondicherry and Bhimtal near Nainital. The client list consist of top multinational companies like Philips, Ikea, TVS Electronics and Procter and Gamble. The clientele consist of companies from Automobile sector and Electronics products. As of this writing Company has dedicated plant setup to cater need of Clients for example Bhimtal factory caters need of Eureka Forbes, Pondicherry Plant is used for Procter and Gamble. Now lets look at performance of this company over the years.As per Dow theory of technical analysis price performance over a period of time reflects Company state. 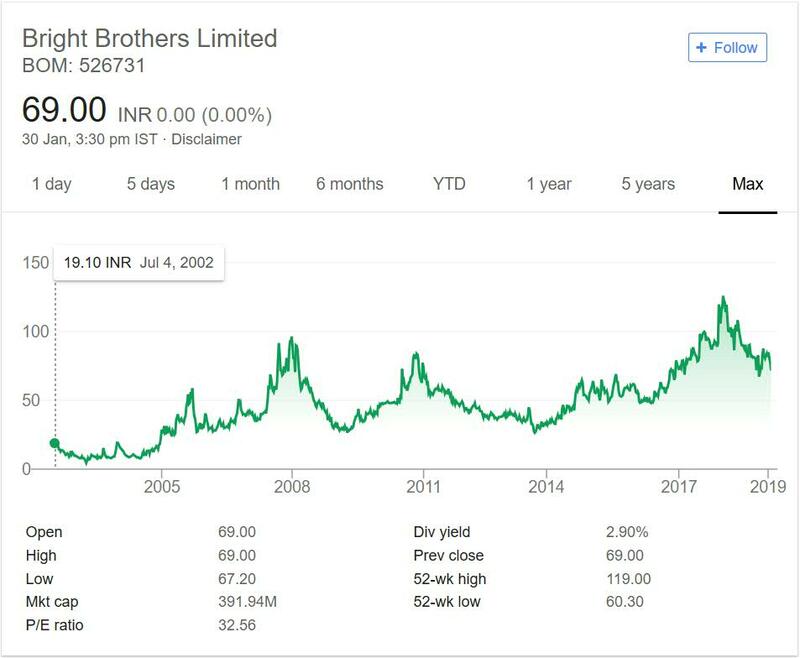 Bright Brothers limited was trading at 19 INR mark in year 2002. The stock zoomed to 100 levels in next 6 years but during great recession of year 2008 it crashed below 50 mark. Next five years were roller coaster ride with company rising and falling to 90 marks and 40 mark.It again zoomed past 100 mark in next four years during the bull run. But in 2018 correction the prices went down 70 mark. The stock price chart is an roller coaster ride for past 16 years or so. It has moved up and down at brisk rate. If you see in terms of absolute return it has given 3 times return in these 16 years. This is better than fixed deposit if you take dividend into account as well. The dividend yield of 3% is attractive at current market price. Note to calculate the absolute return we have taken current market price into account. The company has performed decently in this time frame. Bright Brothers Limited have some important Clients in their portfolio. These are big clients and Company performance depends on them. They will have to add new clients in portfolio so as to decrease dependency on existing few number of clients. All the factories have one to one mapping with Clients. So if it loses one client then Company will become liability from asset. This is the key challenge in front of Bright Brothers. They will have to expand their client list and maintain existing one. Also they can focus on End Customer market products instead of Industry focused products. Based on the stock performance in past and potential of plastic sector in future it is interesting pick. But there are too many players in Plastics sector dealing with Customer products as well as Industrial products. You need to include these companies in your studies if you are planning to have one plastics company in your portfolio. I will not track this company as there is nothing unique about it. In case you are interested then you can track the company by adding it to your stock watch list. That way you can keep close eye on the Company.